In some ways, the food blogging/writing world misleads us. If you believe everything you read, people out there are cooking new, interesting, fresh, inspired things all the time. On the one hand, this can inspire you and give you lots of new ideas, recipes, ingredients. The blogging world is great for that. On the other hand, the constant stream of new content can put a lot of pressure on the cook in the house. It can be hard to measure up, not just in terms of skill and innovation, but simply in terms of getting something new and different on the table every single night. Where are the leftovers? The repeat meals? The meals that come straight out of the freezer? The take-out or pizza nights? Not to mention: those nights when activities and work schedules mean the kids have to eat separate meals and the parents eat even later. Pete Wells got it right: sometimes we are just too busy to cook. It is true that I do try to cook every night. But last night? Wednesdays are my teaching night, so my sitter prepares what I leave, and my kids had TJ turkey chili out of a can. Which, for the record, they think is one of the best things ever. Also: we eat an awful lot of the same things for weeks, even months at a time. This is what happens when you eat seasonally. When it’s tomato season, we eat tomatoes. Lots and lots and lots of them. We’re Italian like that. You can romanticize it all you want, but it’s not exactly inspired. And unless you’re Mark Bittman, it can be a challenge to figure out something to do with all the same stuff day in and day out. A girl can dream and plan and try, and lots of us do, of course, but if you’re not a food professional, and you’re tired, it can be a lot of work to be inspired. Moreover, we have had an unusually busy week. A slight shift in Ella’s schedule has meant that she has 20 minutes to eat dinner in between Finn’s drop off and pick up from swimming and her own drop off at soccer. I have no idea when Finn is going to eat. Our afterschool hours are such that I have to have dinner ready for them both to eat by 4pm. Because between 4-7 pm, I won’t be home long enough to cook. Certainly, this week is not usual, but the fact remains that there are plenty of other families who face this challenge on a regular basis. It’s one thing to cook and eat a family meal when your kids are young. I found it a hell of a lot easier to cook for toddlers than it is now, with a 6 and 9-year-old. It doesn’t help to say my family dinner will never be sacrificed, because if your kids have activities, sometimes it will be. All of which is to say that how we cook and how our families eat our meals changes. I am here to say: it’s okay some nights to eat on the run. It’s okay to eat the same thing over and over again. Which brings me to my dinner dilemma tonight. What could I cook that would keep from 3:45 pm until 8 pm? I had tomatoes, corn, and hooray! a package of gnocchi, which, once cooked, keeps far better than pasta. I have a bin full of good produce: green beans and great lettuces for a side dish or salad. Also some good mozzarella. And this morning I was talking to my very dear friend Melissa Clark, the novelist, who introduced me to gnocchi, and is also a contributor to our book. Then there was Caroline’s post yesterday, and dishes I’ve made before, and this is the result: our end of summer (and end of a very long day, and nearly the end of the week) pan fried gnocchi. Mince the garlic & sautee in olive oil and butter in a large pan. 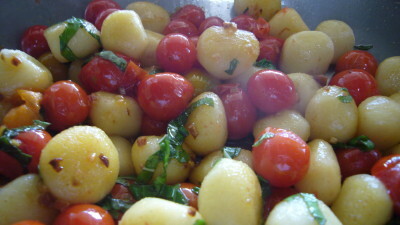 Add the gnocchi to the pan & cook until heated through and lightly golden brown. Remove from heat, and in a large bowl gently toss in tomatoes and corn. Toss in mozzarella and basil. Serve immediately or after (soccer/swimming/piano/tutoring), at room temperature.